Gluten Free & Allergy Friendly: Giveaway: Shabby Apple Jewelry! What better way to celebrate the season of giving then with a GIVEAWAY!! This giveaway is compliments of the WONDERFUL people over at Shabby Apple. Shabby Apple is an online dress boutique selling women’s dresses, casual dresses, skirts, women’s apparel, and accessories. They are always designing new dresses and entirely new fashion lines. I just love their aesthetic... and I especially LOVE their vintage jewelry! "The White Rabbit's Time Keeper"
This beautifully crafted pocket watch necklace is made of etched antique brass metal. Glass front opens to reveal clock. Glass face is diamond cut in a lovely shade of golden brown. 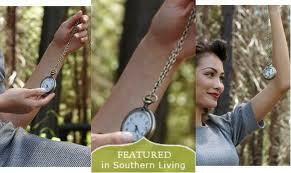 This gorgeous necklace was featured in Southern Living magazine. Please checkout Shabby Apple on Facebook! There you'll find out about the latest fashion lines, giveaways, and coupon codes. How do you get this fabulous piece into your hands?? Be a follower of Keeley McGuire Blog via GFC or Facebook, then leave a comment here on this post letting me know! Giveaway will end at 11:55pm EST on Monday, December 26th. Giveaway is open to US shipping addresses only. Winner will have until December 31st at 11:59pm EST to contact me at keeleymcguireblog(at)gmail(dot)com to claim their prize. The winnner's information will be given to Shabby Apple, who will mail the winner their piece directly. To sweeten this amazing giveaway even more, the wonderful folks at Shabby Apple have given all of you a special 10% discount just for being a Keeley McGuire Blog reader! Just use code "Keeley10off" - code will expire in 30 days. not too shabby! i know, but no one said it yet! i am a new follower to your blog, after finding out about this giveaway on FFM. yay! What a beautiful piece! I follow you on GFC and FB :) Have a wonderful holiday! I just started following your blog, I Love this necklace! I am your newest follower on the gfc! Oh my goodness I love SA!! I would love to win! 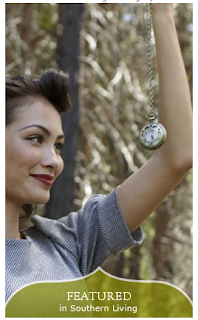 I'm a new follower - I'm a huge fan of Shabby Apple and have a couple of their dresses. So gorgeous!